Summer is a happy time for me, but I suspect that’s my preconceived attitude. I want summer to be happy, because it contains so many things I like. Happiness is an elusive concept. We all want to be happy, but we don’t define happiness in the same way, which makes becoming “happy” a bit tricky. Professor Laurie Santos at Yale University wants her students to be happy, so she created a new course: Psychology and the Good Life. Santos bases her course on positive psychology, a field focussed on well-being and how we can change our behavior to our advantage. There’s been a lot of research on happiness, and one thing that specialists agree on is that what our mind tells us will make us happy probably won’t. 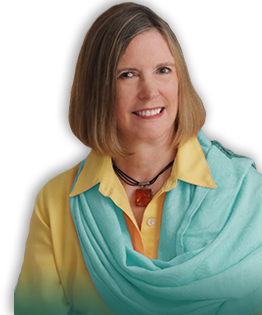 Sonja Lyubomirsky in The How of Happiness reported 50 percent of our happiness is genetic; 10 percent is determined by our circumstances, and 40 percent comes from what we think, the actions we take, and our attitude. It turns out there are two types of Happiness: Natural and Synthetic. Natural happiness occurs when we get what we think we want, but that euphoria fades with time. Most things do. The new iPad isn’t so new when the next model appears. Synthetic happiness is the state of mind we control. Sort of like turning lemons into lemonade. Or being happy at how well your iPad works. General happiness is a combination of Natural and Synthetic, but it seems as if the Natural is less important. At least from a scientific perspective. Dan Gilbert, Professor of Psychology at Harvard, spends his career defining the way Synthetic Happiness occurs and it’s stability over the long term. And, according to Santos, we can rewire our brains to achieve a state of happiness. A happy life is learning to enjoy what you have. This isn’t a revolutionary idea. I find it interesting that you can get college credit for a course about it. But then, happiness is now an international goal. Since 1972 when the King of Bhutan first voiced the idea that Gross National Happiness is a better goal than Gross National Product, happiness has become part of the United Nations’ agenda. In 2011, the General Assembly passed a resolution naming happiness as a fundamental human goal. WHERE IS THE HAPPIEST COUNTRY ON EARTH? A ranking of 156 countries appears every March to inform us which countries are the happiest. Rankings are based on income, freedom, trust, healthy life expectancy, social support, and generosity. Scandinavian nations always seem to place in the Top Ten. This year Finland became officially the happiest nation on earth. Bhutan came in at 97th place. The United States ranks at eighteen, four spaces lower than last year. The unhappiest country is Burundi, a very poor landlocked country in Africa emerging from a civil war. There are basic necessities — food, shelter, safety, and good health. Once basic needs are met, people who are happy tend to share certain attributes. They spend time with family and friends, keep an optimistic attitude, are physically active, and practice gratitude. Yet not everyone in Finland is happy, and not everyone in Burundi is unhappy. Because, if you believe Dan Gilbert, happiness [once you have basic necessities] is our minds. Below is a thirty minute video of a 2013 talk Dan Gilbert gave at the Annual Israeli Presidential Conference: “The Science of Happiness: What Your Mother Didn’t Tell You.” As Gilbert makes his conclusion, there is a conversation going on picked up by a live microphone, but by then you’ll know what he concludes. My final thought on happiness is it’s not about the science. It’s about the joy of something so silly as this children’s song. 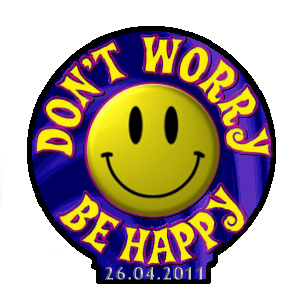 Don’t Worry Be Happy by Krol111, Creative Commons Attribution. 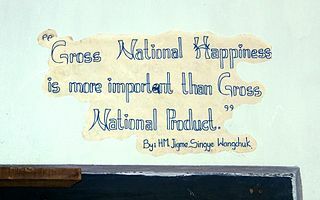 Bhutan Gross National Happiness is More Important than Gross National Product. Public Domain. Katia Hetter. “This is the World’s Happiest Country in 2018.” CNN Travel. Mar. 15, 2018. Adam Sternborough. “Read this Story and Get Happier.” The Cut. May 28, 2018.